The college first installed EV charging stations in 2011 in the Carlsen Center West parking garage lower level. Due to the popularity of these stations we added more to our Galileo Parking Garage located on the south side of campus. Recently, in a partnership with KCPL we have added 12 new parking spaces dedicated for electric vehicle charging near the track and field and at our offsite location, the Olathe Health Education Center. Check availability JCCC charging stations. The Green Commute Challenge is an annual event sponsored by the Mid-America Regional Council (MARC). The competition aims to remove motorized vehicles from the road during peak commute times and during ozone season (July and August) in Kansas City. It's an employer-based contest that encourages the use of carpooling, vanpooling, riding the bus, bicycling, walking and telecommuting. All JCCC staff, faculty, and students are encouraged to participate. MARC awards weekly and monthly prizes to individual participants. Last year's prizes included Kindle e-book readers, gift cards, and more! JCCC offices who are participating in the e3 Sustainable Office Challenge are also able to earn additional points for their office members' participation. RideKC in Johnson County provides several public transportation options. Micro Transit. Order on-demand public transit service using the Microtransit app. Get picked up at your house and dropped on campus at your convenience with no commuting or parking hassles. 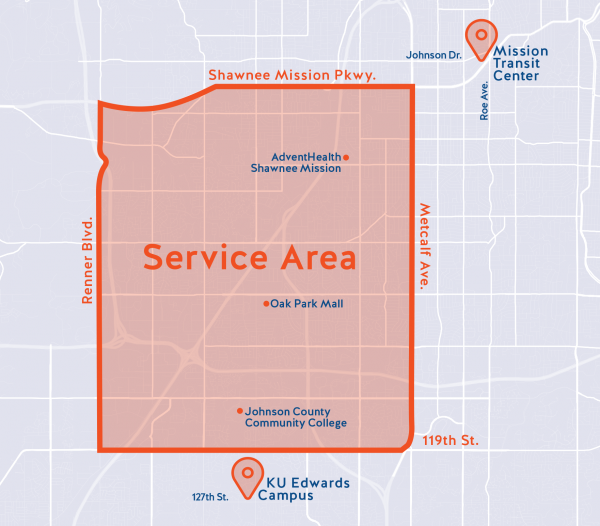 Available: Monday – Friday, 6 a.m. to 8 p.m.
Service area (map): Metcalf Avenue to Renner Boulevard; Shawnee Mission Parkway/63rd Street to 119th Street. More information: Visit the RideKC webpage or contact Mark Swails at 913-469-8500, ext. 3773. Bus service. Take the bus during the week, including the K-10 Connector to Lawrence. For rider information, including maps and schedules, visit RideKC.org. Students can purchase tickets at the student info desk. Campus Services is now using bicycles instead of trucks for traveling across campus. Employees in Campus Services have embraced the two wheels to get across campus faster and more efficiently. Whether they are hauling a small toolbox or a weed trimmer, they can get around without the use of gas. Bicycles have proven to be more convenient for moving around the inner campus, where it is difficult to travel with big trucks. JCCC currently has eight bicycle rack locations throughout campus. Shower and locker facilities are available to bicycle commuters in the GYM building. These facilities are provided free of charge to all current JCCC students, staff and faculty. Current students, staff and faculty may go to GYM 116 to reserve a locker for their personal use. Reservations will last one semester each. The National Highway Traffic Safety Administration produced the video below, which offers great safety information and general bicycling tips for bicycling on roadways. Carpooling is a great way to significantly cut your commuting costs while lowering your environmental impact! JCCC participates in RideShare, a FREE carpool matching service provided by Mid-America Regional Council. All JCCC students, staff and faculty are welcome to participate. The RideShare website can be used to log all of your alternative commuting trips including bus, bicycling, telecommuting or walking/running. JCCC students, staff and faculty who log their alternative commuting trips with the RideShare website are eligible for prizes throughout each semester.